Tomorrow marks the first day of fall, where did the entire month of September go? Here I am scrambling to get this post out before the 23rd officially rolls around, so in the spirit of being constantly late to the game, I'm sharing one last late summer recipe with you guys because I'm not ready for six months of winter squash. Just like the recipe, this post is going to be short and sweet, mostly because I don't really have much to say today, but also in part because I've been trying my best to enjoy time away from the computer screen lately, doing things like biking, walking, and for the first time tonight, climbing! Work's been good, I've been super busy, I went to a launch party for Sam's new cookbook (which you should buy because it's amazing and she's one of the most talented ladies ever), and I've been obsessed with making a vegetarian Chicken Shack at home, so much so that it was dinner almost every day last week. And that's it, that's my life update, that's all I got. Now on to the plums and ice cream! This recipe is super simple: you roast some plums with honey and butter for all of 15 minutes, you churn some ice cream, plop that on top of the plums, and devour. Okay, it's a little more complicated than that, but not by much. For its ease, there's such a great contrast of flavors and textures in this dish. The warm, tart, and fleshy plums against the cold and sweet ice cream make a wonderful pair. 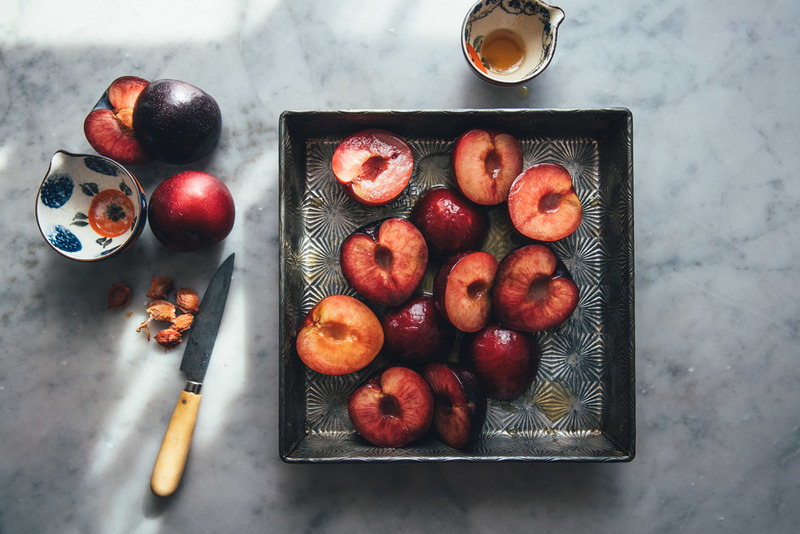 My only wish is stone fruit season would last a little longer so we can enjoy this dessert even as the weather gets colder. The day before, place the bowl of your ice cream maker in the freezer. Place sugar and salt in a medium saucepan. Split the vanilla bean(s) lengthwise, scrape out the seeds, and add to the sugar mixture. Using your hands, work the vanilla seeds into the sugar until no clumps remain. Add the scraped out vanilla beans into the saucepan along with 1 cup cream and the milk. Warm the mixture over medium heat, stirring occasionally, until the sugar has completely dissolved. Turn off the heat and add the remaining cream and bourbon. Stir until combined then transfer to an airtight container. Place in the fridge until completely chilled through (overnight is best). Churn the mixture in your ice cream maker according to manufacturer instructions. I use a Cuisinart ice cream maker that usually takes 20 to 25 minutes. Once the ice cream is soft serve consistency, transfer to a container, cover, and place in freezer to firm up. Heat oven to 400 degrees F. Halve each plum and remove their pits. In a large mixing bowl, lightly toss plums, honey, and butter together. Transfer to a baking pan, arrange plums in one even layer, and roast for 15 minutes until slightly tender. Remove from oven and let cool 10 minutes. 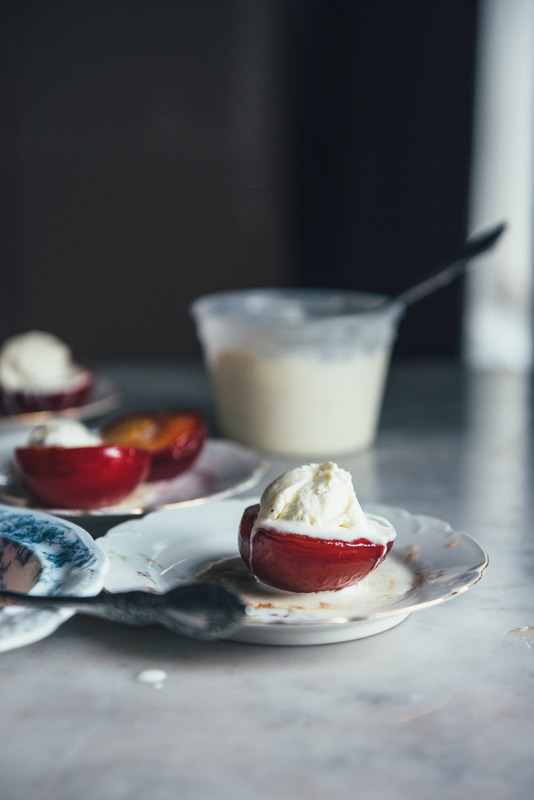 Divide plums between six plates and top each with a scoop of vanilla ice cream. Enjoy immediately.